Because I love chocolate and I love raspberries. And I love them together. Follow the directions on the photo above, using a mini muffin tin. Let warm up a little bit and then use a knife to pop them out of the muffin tin. Keep chilled or frozen until serving. Try not to eat more than 13 at once. Kidding, maybe. But not really. Oh, and if use dark chocolate chunks…then supposedly that’s good for you. Like, really good for you. I choose to believe that. Because I’m healthy like that. Melt the chocolate in a microwave safe bowl. Cook on high for 45 seconds, then stir and cook another 45 seconds and stir into creamy chocolate. 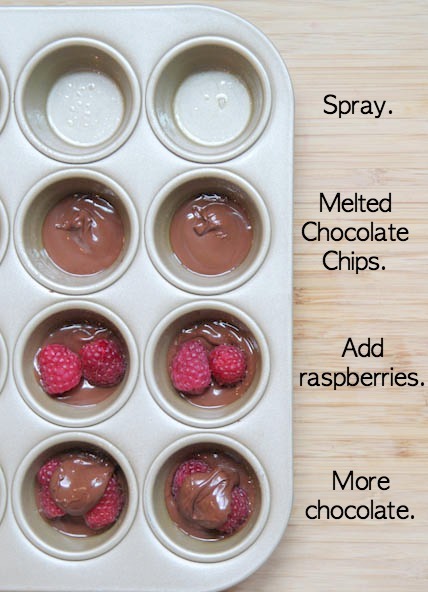 Drop a teaspoonful of chocolate into each mini muffin tin, then add a raspberry or two on top. Then add another small dollop of melted chocolate on top. Chill in the refrigerator for at least an hour, or until chocolate is firm. Let warm slightly before popping the bites out of the mini muffin tin with a knife. Keep chilled until serving. Freeze in a plastic container or baggie up to 3 months. These look so yummy and easy! Do you think this would work with other fruit like strawberries or bananas? Some of my kids are not to fond of raspberries. Absolutely! Strawberries and chocolate would be amazing. Feel free to experiment to see what your family loves! Very delicious!! thank you for sharing this recipe.